There was a time, not so long ago, when the Inuit dog was nearly extinct in Nunavik. Many elders were still reeling from the alleged dog slaughter conducted by the RCMP in the 1950-60s. However, memories of dog teams from the time people had no other means of transport were still alive, even though it had been several decades since the snowmobile displaced the qimmiq. 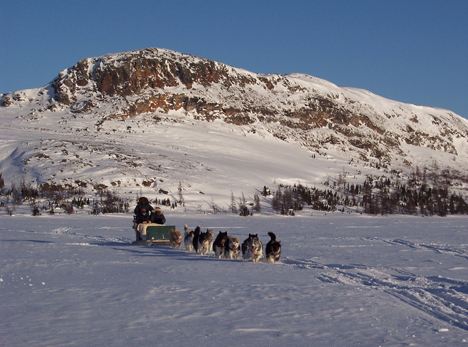 There was a desire to bring back the dogs to Nunavik. Makivik corporation, an organization representing the Inuit of Nunavik, was instrumental in organizing the first dog race. Johnny Watt, an old timer dog team driver named the race Ivvakak, which means “when the dogs are at their best pace” in inuktitut. The race was to go along the Hudson’s Bay Coast, from Umiujaq to Puvirnituq, passing through Inukjuak. One rule of the race for the contestants was that the qimmiq had to look as close as possible to the dogs of their ancestors, and were to used the kamutiq. Nine teams and eighty-two dogs were at the start encouraged by the whole community. Children and youths were particularly excited. Teenagers wishing they had their own teams. This was what the organizers had hoped, that young people would discover a sense of pride and plan to raise their own dog teams. The race followed the ancient trail used by the men of the Hudson Bay Company to deliver mail between communities. The Inuit driving their qimutsik (kamutiq or komatiq) were not so much racing as making a pilgrimage on their ancestors’ trail. The fact that the competition was supported by helpers on snowmachines didn’t detract from the feelings of accomplishment the Inuit experienced. Life on the land is still as it used to be despite modern conveniences such as Coleman stoves, rifles and tents. Tamusi Sivuaraapik, with a fine team of Inuit dogs, was first to cross the finish line, having covered 275 miles in one week. A deliriously happy crowd greeted him in Puvirnituq. The work changes, Inuit lifestyle evolved but some traditions will never die. Ivvakak is proof to that, as are the projects of Qimmiit Utirtut - the dogs are back, in inuktitut – that are florishing in Nunavik.